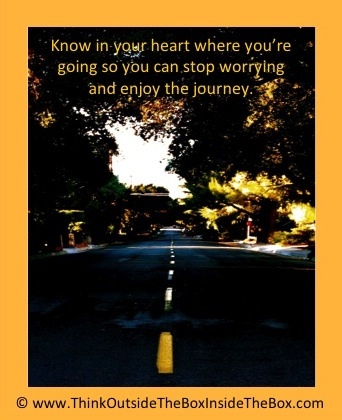 Instead of constantly asking, “are we there yet?” focus on enjoying the journey! If you know in your heart you’re going where you’re meant to go, why worry about whether you’ll get there or when? Relax. Be confident in this moment. Savor the here and now—the truth is, you’ve already arrived. Right here, right now, it’s all you really have anyway. Create from it. Enjoy every moment of it. Be confident you’re going where you’re meant to go. Stop worrying whether or not you’ll get there. Stop stressing about when you’ll arrive. Create from what you have…this moment on your journey.